UCLA researchers, who for years have faced harassment and attacks from anti-animal-research activists, were heartened Wednesday as roughly 700 supporters joined them in calling for an end to the intimidation, fire-bombing and violent threats. 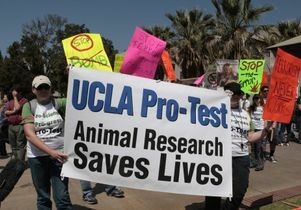 The event – a pro-research demonstration, in part to counter a rally held on campus by the anti-animal research activists at the same time – marks the first action by the new group UCLA Pro-Test. UCLA neuroscientist David Jentsch formed the group after extremists set fire to his car parked in his driveway while he slept on March 7. This act of violence was followed by online threats to "do a lot more damage than to your property." "I hope this rally lessens the sense of helplessness and fear that has pervaded our community," Jentsch said as the group marched to the Court of Sciences. The line of marchers stretched close to a quarter mile long. "We’re just not going to take the harassment anymore." Jentsch, an associate professor of psychology whose research includes using monkeys to find treatments for mental disorders such asschizophrenia, is one of about 10 UCLA researchers who have been frequent targets of the extremists. He said he hopes UCLA Pro-Test will help the public understand how essential animal testing is for finding cures and treatments for devastating illnesses. While gathered at Westwood and LeConte, the UCLA Pro-Test crowd stood directly across the street from a Stop Animal Exploitation Now (SAEN) rally of about 40 people. Dozens of police from UCPD and the LAPD stood by, and reporters rushed back and forth between the two sets of chanting crowds. UCLA Pro-Test members held signs that read, "Our researchers deserve thanks, not threats" and "Animal research has ALREADY saved your life." Neurology Professor Claude Westerlain, who uses animals in his research on epilepsy, said he came to the rally to oppose the terror tactics that some of his colleagues have faced. "I haven’t been bombed myself, but I have friends who have been bombed," he said. "Most of the activists are well-intentioned, but a few are common criminals. Even the ones with good intentions are mistaken when they say there is no need for animal research. There is no way to do research on epilepsy without animals, and the suffering we relieve is enormous. Animal research saves lives. There is no medical progress without it." Members of SAEN argued that animal research harms animals without benefit, because scientists cannot predict with certainty that a treatment that works on animals will necessarily work on humans. "The federal government wastes $12 billion funding this insanity," said SAEN’s executive director, Michael Budkie, who accused UCLA of conducting research primarily to obtain funding. There is no alternative to animal research, countered Gerald Levey, vice chancellor of medical sciences and dean of the Geffen School of Medicine. He and other campus leaders spoke to supporters in the Court of Sciences. Research methods such as computer simulations can supplement animal research, but cannot duplicate the complexity of biological responses in humans and animals, Levey said. "Animal research has played a crucial role in virtually every medical advance of the last century," including the discovery and development of antibiotics, analgesics, anti-depressants, organ transplants, heart surgery and more, Levey said. "Many diseases that ravaged the world are now preventable, treatable or have been eradicated all together. Think about it: Immunizations against smallpox, polio, diphtheria, mumps, rubella, influenza and hepatitis have saved millions of lives, and survival rates of breast cancer and leukemia are at an all-time high, thanks to animal research." Raising the public’s awareness about the importance of animal research is critical, said Scott Waugh, UCLA’s executive vice chancellor and provost. "Everyday, researchers at UCLA change things for the better in our world," Waugh said. "They are courageous, and they shouldn’t have to worry about threats to their safety. … UCLA biomedical research, involving lab animals, has produced incredible progress: a breakthrough for breast cancer, a new diagnosis technique for Alzheimer’s, hope for a new cure for childhood blindness, a device that can reverse strokes and many, many more things." UCLA Professor Lynn Fairbanks, a psychiatry and biobehavioral professor in residence who has used animals in her work, noted that animal research found the treatment for juvenile diabetes, the formerly-lethal disease that her son was diagnosed with. Extremists attempted to target Fairbanks in 2006, but left an unexploded bomb on a neighbor’s porch when they got the wrong address. "Animal research saved my son’s life," Fairbanks said. "A relatively small number of animals contributed to saving the lives of more than a million children. It’s not true what [activists] say, that it doesn’t work … and there’s still so much more to do." Tom Holder, who formed the British Pro-Test group on which UCLA Pro-Test is based, also spoke to the crowd in support of animal research. Since the formation of Pro-test, hundreds of attacks per year against British researchers have now dropped to less than 10, he said. "“Today is going to be remembered as the day scientists stood up and said, 'No more,'" Holder said. "Animal research saves lives, and we want it to continue. … They cannot scare us into silence. They cannot win through violence." Since 2003, UCLA researchers and administrators have been subjected to an organized campaign of harassment intended to halt the use of animals in research. Extremists have claimed responsibility for placing incendiary devices on the doorsteps of private residences and under vehicles, torching a UCLA commuter van, and vandalizing property. Extremists also have made numerous physical threats and staged multiple demonstrations at private homes — sometimes banging on doors and windows in the middle of the night and wearing masks to conceal their identities. Research involving laboratory animals has enhanced our understanding of how the human body functions and has led to the development of lifesaving procedures and medicines, including radiation therapy and other cancer treatments, vaccines, open-heart surgery, mental health treatments, and organ transplantation. There is overwhelming agreement among physicians and scientists worldwide that most of the major medical discoveries in recent decades would not have been possible without the use of laboratory animals. UCLA Pro-Test is modeled after a group formed by Oxford University students in England to counter the protests of extremists seeking to block the construction of a research facility. The Oxford group has been credited with helping to rally public support for animal-based research and against extremism. A related group, Speaking of Research, also rallies support for animal research. 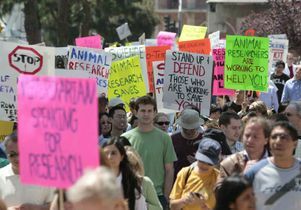 Rally at UCLA in support of biomedical research that uses laboratory animals. April 22, 2009. 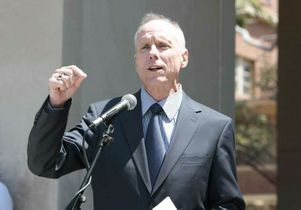 Scott Waugh, executive vice chancellor and provost, at UCLA Pro-Test rally April 22, 2009. Supporters of UCLA Pro-Test group march on campus April 22, 2009. 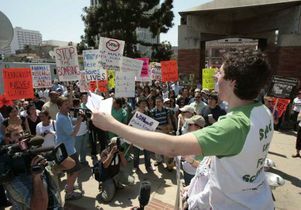 Pro-Test organizer Tom Holder addresses UCLA rally in support of biomedical research on April 22, 2009.